The first two days were spent clearing scrub and 1980s planting from the designed landscape around Monk Coniston. This is important because some of the really impressive mature trees have become lost in scrubby woodland which has developed round them, thanks to the efforts of the volunteers we can 'see the trees for the wood'! After a morning spent meandering the East Coniston woods clearing scrubby growth from the hundreds of archaeology site in the woods (I forgot to take photos - sorry) the rest of the day we spent clearing beech regeneration from Tarn Hows wood. After a well earned day off the group returned for the last two days. Following 3 days of tree and scrub removal it made a change to do some planting - after all what will future volunteers cut down if we don't plant anything now? The planting is part of a joint project with Windermere Reflections to inprove water quality. The site is being returned to native species like oak, alder, birch, and hazel after the larch plantation blew down in 2005. The trees were planted in tubes to stop them being damaged by red deer which are found on the site, after two days the group had planted about 350 new trees. The trees are planted quite close together so they will need thinning in perhaps 15 -20 years perhaps another working holiday can help? The weather throughout the week was terrible with loads of wind and rain but the group remained cheerful and got some really good stuff done. On their last night we where invited to a meal with them at Basecamp. How could we refuse an offer of crisp appetisers, spagetti bolognaise, left over apple sauce and custard (I don't like rice pudding). The evening was great fun and even included a poetry recital! Working holidays run at properties all over the country doing all kinds of jobs so if you fancy a go check out the website. A huge thanks to this years 'woody' working holiday for the work they did, roll on 2015! Building on the success of last year with the ’50 things’ den building area at Wray Castle, the rangers have been getting creative by designing a natural play trail in the woodlands above the area. Families can venture further off the beaten track and test themselves whilst having fun on ‘natural play’ features. We hope to inspire visitors ever further into the wonderful outdoor space at Wray Castle. This is the first stage of the development of the play trail for 2014. We will be adding to the finished trail each season based on where children are playing, what has been successful in the previous year, replace any features that have naturally decayed as well as to continually refresh the trail to tempt visitors back year on year. We had great fun doing research, trying out what other National Trust properties have to offer. Sizergh have a great trail that leads from the car park out into the woods by solving a series of clues, taking you on a fantastic adventure through trees, through walls, over fences and down a rock face! Be sure to go check it out! Staff and volunteers from the South Lakes Conservation Group began work on the Natural Play Trail last week. When finished, this trail will hopefully have balance beams, stepping stones, logs to climb on and up, a nice rest area and even a spiders web to try to crawl through without touching the web! We started by clearing away the tree roots and vegetation to create a route through the trees and round the woodland. Our own Foresters milled some larch for the stepping stones and balance beams… we had great fun and got very warm rolling the materials to site! Rolling the materials up to site can be hot work! The stepping stones and balance beams have to be dug into the ground to make sure they are safe and secure. The play trail will allow children (and adults!) to test themselves, push their boundaries where they are comfortable doing so as well as to encourage exploration and interaction with the natural world. .
Look out for other events planned throughout the summer such as ranger-led 50 things activity days and other self-led activities about the castle grounds to help you tick off your '50 things to do'. This week it is the turn of the South Lakes Upland Ranger team to write this blog and in light of the date it seemed like a great opportunity to remind volunteers that we love them ! 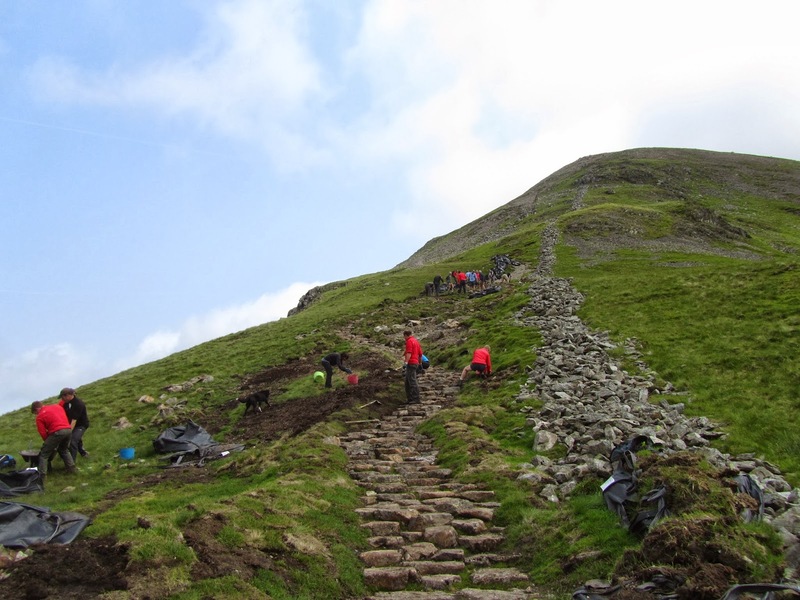 Tackling erosion in the fells of the Lake District is a never-ending task and there is much more to do than the teams can possibly cope with. If it wasn't for volunteers we would struggle to keep on top of the maintenance of existing path work let alone undertake new projects. 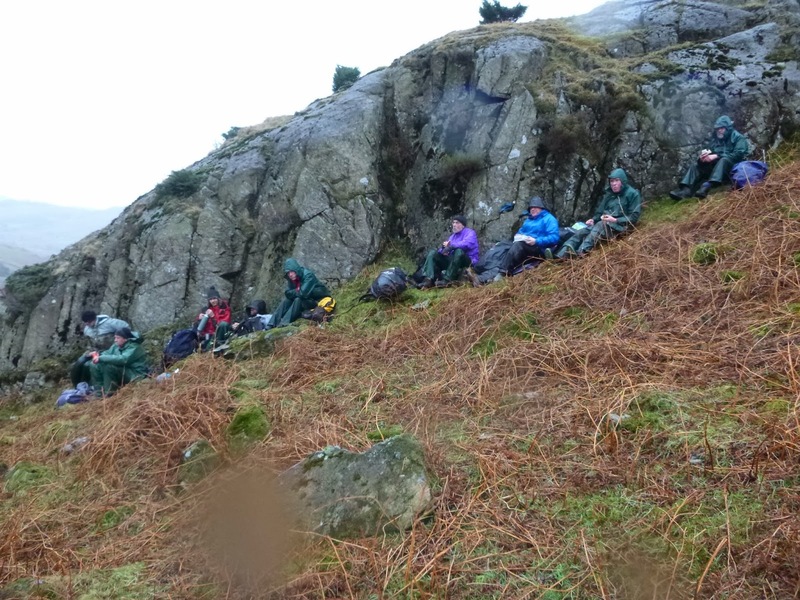 There is one group of volunteers that is particularly close to our hearts; the 'Fix the Fells Lengthsmen'. A 'lengthsman' is a traditional term for someone who looks after a right of way. This group of volunteers is involved in upland path work all year round and in all weathers. We frequently work with them and have got to know them fairly well. In fact two of our current team were first involved in upland work as volunteers under this lengthsmen scheme. path project up Fairfield. A lovely day! work party near Blea Tarn. Not such a nice day ! The volunteer lengthsmen carry out a range of important tasks. One of the main ones is the "drain run". This involves walking existing routes where path work has been carried out, clearing the drains and clearing any gravel and loose material from the sections of " pitched" stone steps. 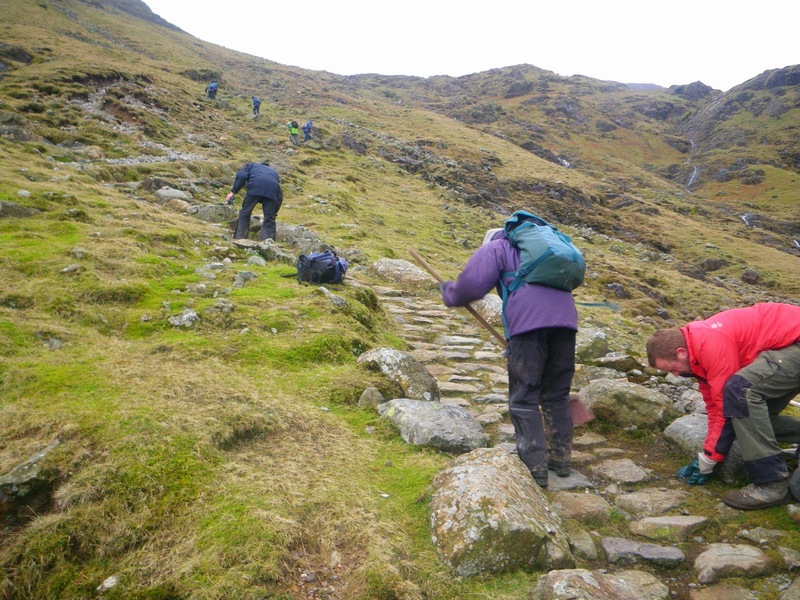 It is also an opportunity to check the general condition of the paths and report back on areas in need of attention. The lengthsmen do an excellent job of coordinating their own drain runs and most weeks several drain runs take place around the Lake District. They are also involved in project work which might include repairing or building new drains, pitching sections of path with rock and landscaping to define the main path and remove shortcuts. Much of this is done in work parties with the upland path teams and some mini projects are carried out independently. Lengthsmen building a drain on a route up Coniston Old Man. It is often a case of 'many hands make light work' and the progress from a work party day can be quite striking. A section of erosion developing on a path by Raise Beck. Fix the Fells lengthsmen hard at work on the eroding section. The results of the work party - a much better looking section of path. The lengthsmen are a fantastic group & always willing to get involved & help out even at fairly short notice. Last year, when weather conditions had delayed preparations, they helped us fill bags with rock just in time for the helicopter lifts that moved the rock from the screes to the nearby project site. Today the South Lakes Upland Ranger team are out on a drain run with some of the lengthsmen and some potential new recruits, who will hopefully enjoy this "taster" day. The focus of this blog has so far been our main group of upland footpath volunteers that we have got to know (& love) over the last few years. We are also fortunate to work with lots of other volunteers. We sometimes have individuals who wish to work with the team, it might be just the odd day or other times a few weeks, perhaps using holidays. Fairfield path project last summer. 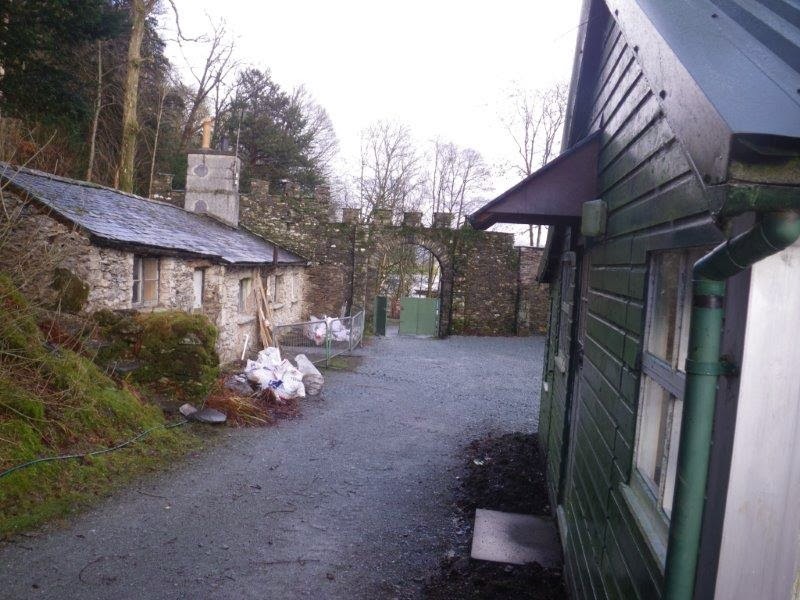 Our volunteer centre at High Wray Basecamp frequently involves us with their volunteer groups. Examples might range from groups of college students doing outdoor courses to rehabilitation groups. 'West Runton' helping on the Blea Moss path project. Other volunteers include groups that enjoy the fells in their leisure time. Aware that they are contributing to the erosion problems they also want to do their bit to help. We usually run two upland footpath working holidays each year. This involves up to 12 individuals joining us for a week's "holiday" working on our upland path projects. Our working holiday group on the Fairfield path project last September. 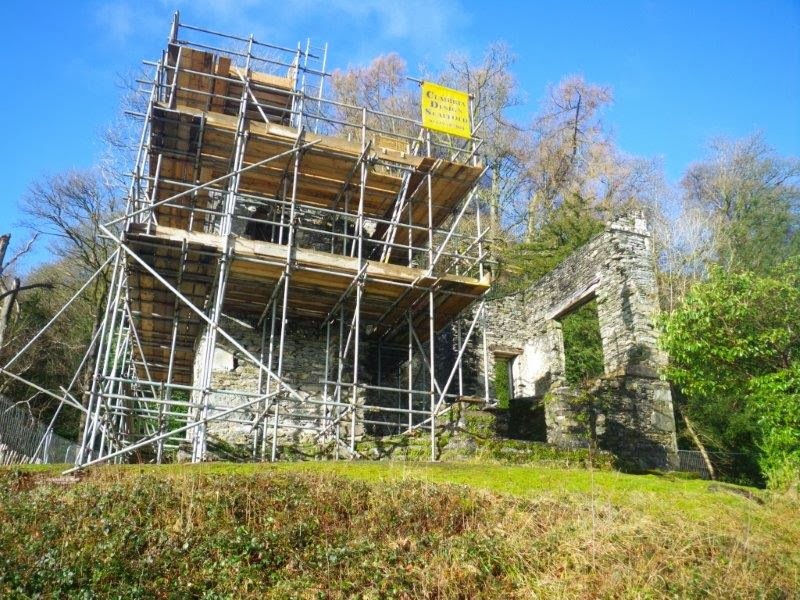 Claife Viewing Station will be stepping back into the limelight again after a hundred years of being ‘out of fashion’. For years Claife Station has been an interesting ruined oddity hidden amongst the trees above the ferry on Lake Windermere, but recent works to restore the views and an exciting new acquisition mean that the Station may once again be the centre of attention as it was when it was the Lake District’s 19thCentury equivalent of the ‘London Eye ‘. 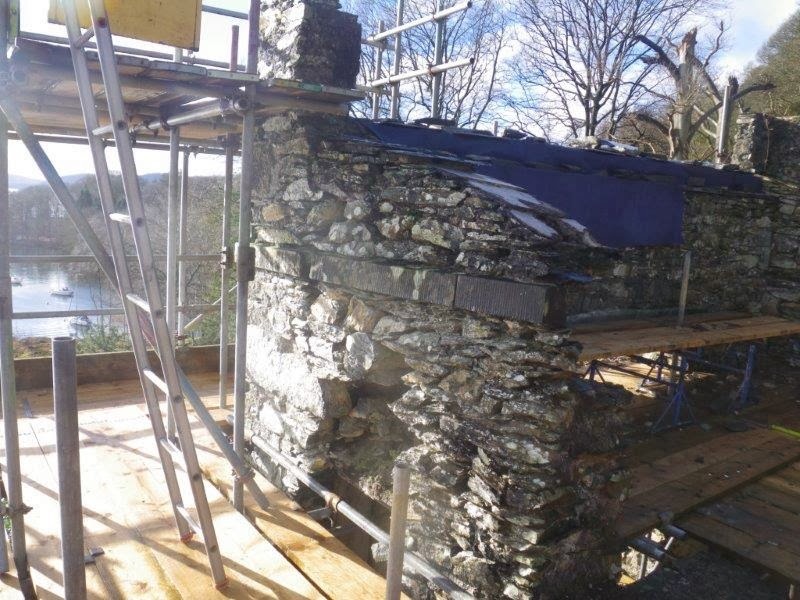 Recent forestry work to restore the views has made the Station more visible from the East and the South , further tree work is planned to the North which will open up the classic view across the Lake Windermere archipelago to the Troutbeck fells. These views enticed early 18th and 19th Century visitors to the Lake District in search of the thrill of the ‘picturesque ‘ , following the earliest guide books, they were guided to the best viewing points or ‘stations’ . Visitors, we hope, will return in numbers again in the 21st Century to discover the fascinating story of the Station and the Windermere catchment. In the next few months we will be repairing and restoring some of the features and stabilising the structure of the viewing station . Last year we replaced the cottage roof and this year we are replacing the external rendering and decorating inside and out . By early summer we will have on site catering facilities and visitors will be able to enjoy refreshments in the cottage by the log burning stove or in the sunny courtyard. We will also be creating a new visitor experience and further improving the views. You may also like to visit the local Ash Landing Nature Reserve as part of your visit . 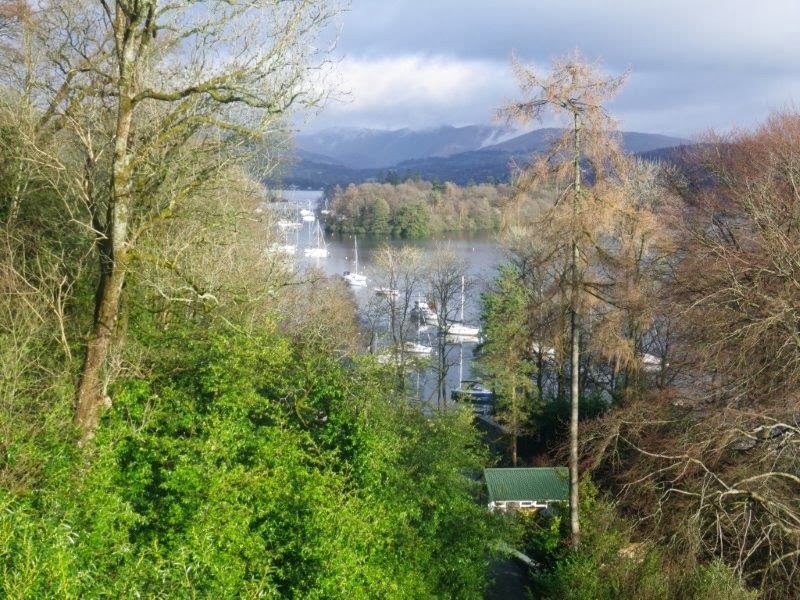 This was the location for those earliest tourists to Windermere, and we hope that you will visit us this Summer , see how the project is developing and experience some of that same thrill that they experienced.